Not many studies have been published on the prevalence of SWD and its related health problems among nurses especially in India. This study will help to identify the prevalence of SWD and its associated factors in a typical tertiary care setting. Thereafter, interventions can be planned to improve the quality of work life of nurses that in turn improves the quality of patient care, thereby beneficial for the management. Nurses' turnover could be minimized which is a major problem in the discontinuity of the patient care. This study would give an opportunity for the nursing staff to express their difficulty in professional life especially during the shift work. To identify the health problems associated with SWD among nurses. The list of nurses was obtained from the Nursing Superintendent's office. Nurses were selected by simple random sampling and the work place and contact details of the selected nurses were collected from the Personnel Department of the hospital. Permission was obtained from the concerned authorities and we made sure that data collection did not interfere with the daily routine of the staff. After obtaining the informed consent, the study participants were interviewed to collect information regarding age, education, date of employment, type of occupation, working conditions, duration of work, shifts, and present health status. Chronic illness was elicited through past history. All nurses were assessed on problems of shift work using a pretested and validated questionnaire. A structured interview schedule was used to collect relevant data from the respondents. Bergen Shift Work Sleep Questionnaire (BSWSQ): It is a questionnaire to assess the sleep problems. This study was approved by the Institutional Ethical Committee. After establishing rapport with the nurses, the purpose and procedure of the study were explained. Informed written consent was obtained from the participants and the interview schedule was administered to the participants. The data were entered and coded in Microsoft Excel and were analyzed using Statistical Package for the Social Sciences (SPSS) version 16 (SPSS-Inc., Chicago, IL) for proportions, frequencies, and associations. Measures of central tendency, dispersion, and Chi-square tests were used to analyze data. We considered P value of less than 0.05 as significant. When more than 20% of the cells in tables had value less than 5, then we considered Fisher's exact test for significance. The study population comprised of 130 female nurses. Of the 130 nurses, nearly 68% were less than 30 years of age and the mean age was 27.4 ± 2.64 years. Nearly 50% had the work experience of 1-2 years. The demographic details are represented in [Table 1]. Majority [110 (84.6%)] of the nurses had been working for around 50-100 night shifts in the last 12 months. Around 71 (54.6%) of the nurses had 1-2 years of experience in shift duties. The work schedule of the nurses is explained in [Table 2]. The prevalence of SWD was found to be 43.07%. Of this, 41 (31.5%) were in the age group less than 30 years, and 35 (26.9%) with work experience of 1-2 years had SWD. 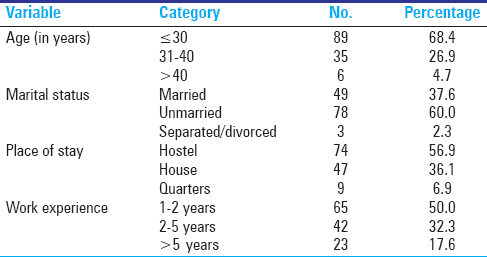 [Table 3] explains the prevalence of SWD by age and years of experience. Headache, back pain, gastritis, and menstrual disorders were the most common complaints related to shift work [Table 4]. Anxiety and depression were found in 23 (17.6%) and 31 (23.8%) of the individuals, respectively. According to the BSWSQ, 70 (53.8%) were found to have sleep problems. Out of 130 participants, 59 (45.3%) were also found to have more than normal intake of beverages when they were asked-"Do you drink Coffee/tea/cola (with caffeine/energy drinks) more than usual during your shift work?" We found that there was a statistically significant association between the presence of SWD and age, number of nights worked in a year on univariate analysis [Table 5]. There was no statistically significant association between the presence of SWD and marital status, place of stay, duration of work, number of years of shift duties and sleep problems. Multivariate analysis showed significant association of SWD with decreasing age. The prevalence of SWD among nurses in the present study was found to be 43%. We found that young nurses who were aged less than 30 years and who had 1-2 years of experience were more likely to have SWD. This is consistent with the previous study done among nurses in Norway, where about one-third of the nurses showed symptoms indicative of SWD, with highest prevalence (45%) in schedules involving night shifts. They also found a positive relationship between the numbers of nights worked and SWD. This is probably because the young nurses with less years of experience are not adapted for the shift work and the mechanisms behind coping with the shift duties. We need further studies to identify the precise reason for this phenomenon. This fact also underlines the importance of educating the nurses and counseling them before giving the shift duties. Rathore et al. in a study done in Rajasthan found out that gastrointestinal and digestive problems, such as indigestion, heartburn, stomach ache and loss of appetite, were more common and sleep problems were found in around 64% among rotating shift working nurses that was comparable to our study. The health problems might be related to the disturbance of biological clock under stressful conditions. In the present study, we had certain limitations such as influence from possible confounding variables (i.e., different work load, environment, work schedule, etc.) was not addressed and recall problems for certain questions, such as number of night duties in the last 1 year, when they did extra night shifts during staff shortage. In medical domain, physicians, nurses, and other ancillary staff are expected to perform their jobs or to be on call round-the-clock. Studies have shown that a greater percentage of health service workers work in a shift system than in any other employment sector. , As of today, few studies have explored SWD, and even fewer have systematically assessed the health problems of the SWD. Thus, there is a challenge in epidemiological research to assess the symptoms of SWD in an acceptable way in order to study its prevalence and associations with differential health problems and other relevant factors. Such research is needed to further understand how to better alleviate health problems related to work schedule. Despite the fact that nurses cannot be excluded from shift duties, appropriate intervention, such as behavioral changes for good sleep hygiene, forward rotating shifts and treatment (in chronoclinic, i.e., sleep medicine), counseling, and periodic screening to overcome SWD will help improve nurses' quality of life and help them cope with shift duty. From an occupational health point of view, induction training programs of nurses can incorporate these measures that need to be reinforced frequently for the betterment of nurses. South African Department of Health. OH services for health care workers in the national health service of South Africa. A Guideline Booklet 2003;1-72. Tankha G. A comparative study of role stress in government and private hospital nurses. J Health Manag 2006;8:11-22. Parent-Thirion A, Ferna'ndez EM, Hurley J, Vermeylen G. Fourth European Working Conditions Survey. Dublin: European Foundation for the Improvement of Living and Working Conditions; 2007. p. 7. Härmä M, Kecklund G. Shift work and health - how to proceed? Scand J Work Environ Health 2010;36:81-4. American Academy of Sleep Medicine (AASM). International classification of sleep disorders, revised: Diagnostic and coding manual (ICSD-2). Westchester, IL: American Academy of Sleep Medicine; 2005. p. 121. Flo E, Pallesen S, Magerøy N, Moen BE, Grønli J, Hilde Nordhus I, et al. Shift work disorder in nurses--assessment, prevalence and related health problems. PLoS One 2012;7:e33981. Saksvik IB, Bjorvatn B, Hetland H, Sandal GM, Pallesen S. Individual differences in tolerance to shift work - A systematic review. Sleep Med Rev 2011;15:221-35. Sack RL, Auckley D, Auger RR, Carskadon MA, Wright KP Jr, Vitiello MV, et al. ; American Academy of Sleep Medicine. Circadian rhythm sleep disorders: Part I, basic principles, shift work and jet lag disorders. An American Academy of Sleep Medicine review. Sleep 2007;30:1460-83. Muecke. A study of the social support and job stress among nursing staff. VGH Nursing 2005;2:59-68. Newey CA, Hood BM. Determinants of shift-work adjustment for nursing staff: The critical experience of partners. J Prof Nurs 2004;20:187-95.